NASHVILLE, Tennessee, May 10, 2017 – SSOE Group (www.ssoe.com), a global project delivery firm for architecture, engineering, and construction management, is proud to announce the successful LEED® certification of Stratford STEM Magnet School. 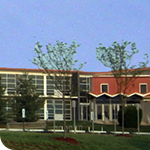 A public school in Nashville, Tennessee, operated by Metropolitan Nashville Public Schools, the facility can house up to 1,200 full-time students in grades 9 – 12. Last month, it received LEED Silver certification under the LEED BD+C: Schools (v2009) rating system from the U.S. Green Building Council’s (USGBC) Leadership in Energy and Environmental Design (LEED) green building certification program. This $20 million project was a complete renovation that included the replacement of all mechanical and electrical systems, windows, partial exterior cladding, and finishes. Additionally, modifications were made to the main entrance, kitchen, band room, library, and a corridor addition was provided to connect the main entrance to the STEM area. SSOE provided LEED consulting, architectural design, interior design, mechanical, electrical, plumbing, and fire protection engineering services to this 236,653 SF facility that sits on 30-acres. Originally built in the late 1960’s, the new design invokes a progressive, yet inviting setting that ensures optimal operating efficiencies while providing a functional, flexible learning environment for students and the community suitable for current and future needs. A few sustainable highlights of the project include the reuse of existing walls, floors, and roof, the incorporation of recycled and regional construction materials, water efficient landscaping, water use reduction, and optimized energy performance. In addition, the facility earned credit for developing density and community connectivity, having options for alternative transportation such as access to public transportation, bicycle storage racks and changing rooms, as well as designated parking for low-emitting and fuel-efficient vehicles. SSOE’s portfolio of LEED certified projects represents more than $1 billion of investment. While Stratford STEM Magnet School is one of SSOE’s most recent recipients of LEED certification, they have also assisted other schools with LEED certification including Jesup W. Scott High School of Toledo Public Schools (LEED Silver), Ottawa Elementary School, Ottawa-Glandorf Public Schools, Ottawa, Ohio (LEED Gold), and Glandorf Elementary School, Ottawa-Glandorf Public Schools, Glandorf, Ohio (LEED Gold). SSOE’s portfolio also includes projects that are the “first” in LEED, such as the first LEED Platinum automotive manufacturing plant in the world, the first Platinum industrial campus in the U.S., the largest Platinum project in the U.S., and the first Gold LEED certified central utility plant in the U.S.